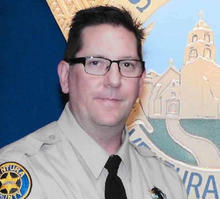 THOUSAND OAKS, Calif. — A sheriff’s sergeant who was killed when a gunman opened fire inside a California bar is being honored as a hero. As an American flag was raised into the sky Thursday, scores of people carrying their own flags gathered outside the hospital to pay their respect to sheriff’s Sgt. Ron Helus. In the crowd, there were people who knew him. “He went out a real hero. We’re very proud of who he is,” one person said. There were others he also never met. “He did his best. He didn’t have to but he did it because it was in his blood,” one person said. Harrison King and Alexis Tait saw Helus’ bravery first hand. They were inside the Borderline Bar & Grill when the bullets rang out. “He went in to make it so that other people are OK, you know. It’s something that I wish I was OK to do, but unfortunately I can’t, so that’s why I’m making sure that he gets remembered,” King said. The one-hour procession through the streets was filled with sadness and silent salutes on numerous overpasses. Each moment was captured by TV cameras and broadcast live on cable networks as Americans grappled with another mass shooting. Helus was on the phone with his wife Karen when he got the call that there was a shooting. He was a year away from retirement after 29 years on the job. But he was the first to enter the building. “He was a hero before and he remains a hero now,” said Ventura County Sheriff Union President Scott Peterson, who went to the academy with Helus some 30 years ago.